Co-op games have become very popular in the modern boardgaming hobby. Pandemic in particular was a huge success and has contributed to the growing popularity of boardgaming generally. The problem with co-op games is that they’re almost always essentially solo games with teammates–that is, they’re games in which the players play against randomizing elements defined by the game rules. Thus, if done poorly, they can feel like you’re just battling a deck of cards (or dice) that say “you lose” or “you don’t lose” on them. The best co-op games know this and do everything they can to prevent the players from taking this reductionist mindset. Pandemic builds a thematic reason for its odd way of randomizing cards. Space Alert adds a real-time element so that the players are battling their own physical limitations as much as they are the game. Forbidden Desert has a cool, thematic spatially-defined randomizing element. And Mage Knight just throws so much volume and complexity at the players that the random elements are insignificant in comparison. I’m afraid that Siberia: Outpost doesn’t avoid the reductionist problem at all. With its brutal difficulty, the game really does ultimately feel like a deck of “you lose” cards. The setting is standard survival horror with subtle references to films like “The Thing”. 2-6 of you are a group of explorers in Siberia who get stuck in a storm and must survive until help arrives. Unfortunately there are a number of obstacles in your way, namely mutated forest animals and various events. Some threats. When they are defeated they go into your deck. On your turn, you’ll draw two cards from the appropriate deck. You’ll then choose one to put into the supply pile–a common group of cards used for various tasks–and one to keep in hand. You can then use the combat value of your cards in hand against any face up threats that have been exposed. After that you can use cards from the supply for their effect–first aid to recover one health point, an ice pick or flamethrower to kill a creature once enough damage has been levied against them, or a flare to cancel a threat’s end-of-round effect that round. After that a new card is revealed from the expedition deck. If it’s a threat it does one point of damage to a player who hasn’t played yet that round (making turn order–which is decided by the players each round–somewhat important). If it’s an event it will cost either one food or one water card from the supply. If there aren’t any to spend, someone loses a life point. This causes the first of many problems with the game. The events, good or bad, will cost a food or water (or health point), and then some sort of boon or penalty. The problem is that many of these events simply don’t make any sense. There are a couple of “good” events that will, for instance, cost a water when introduced, and then provide you with a water. At best that’s a neutral event, not a good one (though in an excruciatingly difficult game I suppose you could consider nothing happening a good thing). At worst, you’ve traded a health point for a water, which isn’t to your benefit. Many of the good events are benign like that, but then there are a couple that will give a health point back to every single player who isn’t at maximum health. This is by far the most significant event in the game, and whether or not these cards begin in the expedition deck or in the draw deck (a random selection are in both piles on setup) can significantly affect your chances of winning. Similarly, the bad events range from painful effects like losing a health to completely and utterly benign effects like discarding a card from the top of the draw deck. If you happen to discard a very powerful card or a first aid kit that certainly hurts. But if you discard a weak card it’s suddenly a benefit. I’m talking about health a lot because this is one of the key things you need to manage. If anyone loses all of their health, the entire group loses. That’s a pretty typical of a co-op game, but the fact that there’s no rule to scale the game for player count is one of the most baffling design decisions I’ve ever seen in a game. 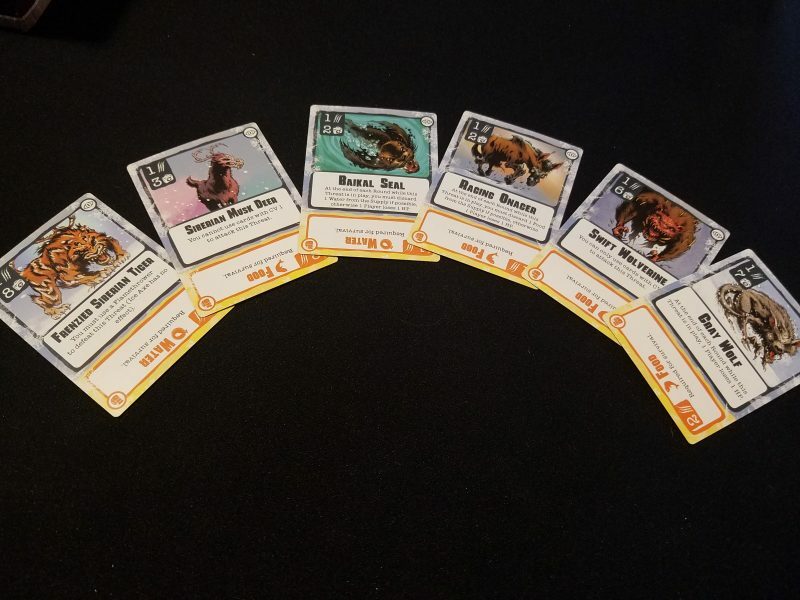 At 2 player or 6 there are going to be 18 threat cards in the deck, and each of those threats will subtract a health point when they are revealed. I don’t even know if it’s mathematically possible to win some games at 2 players. Here’s the back of the napkin calculation: If you choose 2 characters with 4 health, you can take a maximum of 6 health total before losing. There are only 5 first aid kit cards in the game. Let’s assume you get insanely lucky and have all 5 in the draw deck from the beginning. With 6 of the 18 health able to be soaked without losing, the players will need to heal 12 times. Assuming you also get insanely lucky and get both “all heal” cards in the expedition deck. That covers 4 health. The remaining 8 then need to happen between the initial deck and a reshuffle. That’s possible, but it assumes not only insanely unlikely luck in the setup, but absolutely no health lost due to bad events or lacking water/food for an event card. It also assumes end of round monster effects don’t take away more health, which is very likely at 2 players. See, some monsters will apply some bad effect at the end of each round. Since threats are revealed after you attack threats in turn order, a full half of the monsters revealed in a 2 player game, on average, will trigger their effect with the players having absolutely no way of stopping it. That’s not going to happen and with an average distribution of first aid kits, water, food, and healing effects it might not be actually possible to win the game. Not that I’ve won the game at any player count. 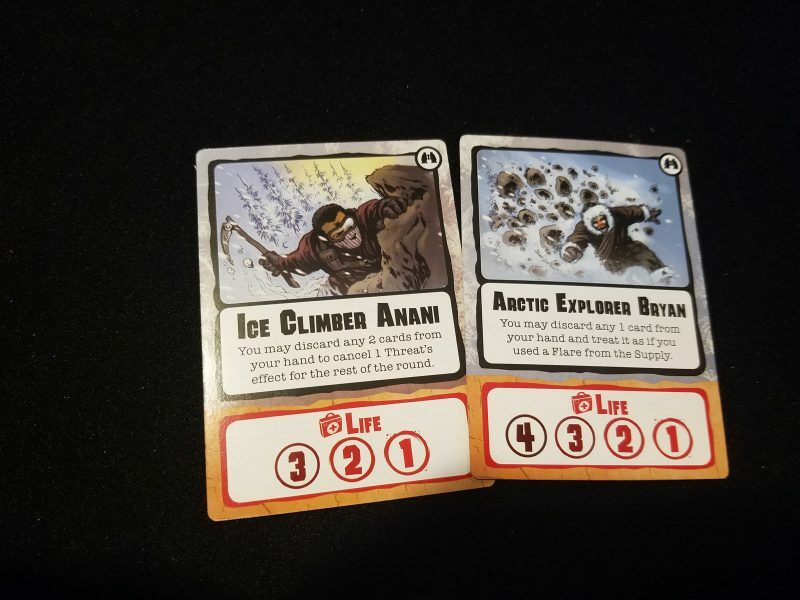 We’ve played a few times with 6 players on easy difficulty and in our best game we got about ⅔ of the way through the deck. For a while I was determined to win the game and even tried making a “very easy” mode where I only shuffled good events into the expedition deck instead of a mix of good and bad. I can’t do it. And I don’t think I’m a slouch at co-op games. We got through Pandemic Legacy in 15 games, which I think is above average, and we generally do well at medium/hard levels on most co-ops. I can only try this out solo now (playing all six characters) because the rest of the group finds it futile. I even scoured BGG, twitter, and facebook to see if anyone has beaten this game, and so far I haven’t found anyone claiming to have won without using house rules to make it significantly easier. The most interesting decisions in the game are over general strategy with regard to the threats. Since you only need to get through the expedition deck to win the game, and not necessarily beat all of the threats, you can leave the most challenging threats that don’t have end of round effects on the board. The problem is that if you ever finish a player’s turn with 5 threats on the table, then you instantly lose. Most of my games have been lost by an unlucky string of threats in a row, even if we managed to keep health under control. And in those cases it really does feel like a game full of “you lose” cards. There’s not enough game here to sustain the illusion of the theme and that just adds frustration to resentment. Maybe there’s a decent game here with some house-ruling. Maybe you like the theme and the admittedly good art full of hideous Siberian monsters. I don’t think, even with a lot of changes, it will ever rise above decent. It kind of tries to be a “Friday”-like deckbuilder, but there’s no way to actually manipulate the deck; every card that gets played or defeated just goes into the discard pile. As it stands now, with the current rules, it simply doesn’t work. Here’s a perfect illustration for the problems with the game at large: there are two characters in that pile of six to choose from. One has 3 life points and the other has 4. The one with 3 life points has an ability where they can discard two cards from their hand to stop a threat’s end of round (or persistent) effect that round. The other character can discard one card to play a “flare”. What does the flare do? It cancels a monster’s end of round/persistent effect. Why are they worded differently? I don’t know; I’ve scoured through the rulebook and can’t find any meaningful distinction between the effects. Why does one have fewer health and an ability that costs twice as much? I don’t know. It seems like it’s a printing error or something not caught during testing, though I don’t know how any tester could miss it. Every time we played the game we commented on how it felt like we were playing it wrong. It didn’t feel right, or fair, or like a game should feel. I’d love to find out that I missed something crucial and revise my review. But I’ve read the rulebook so many times and I can’t find any mistakes. 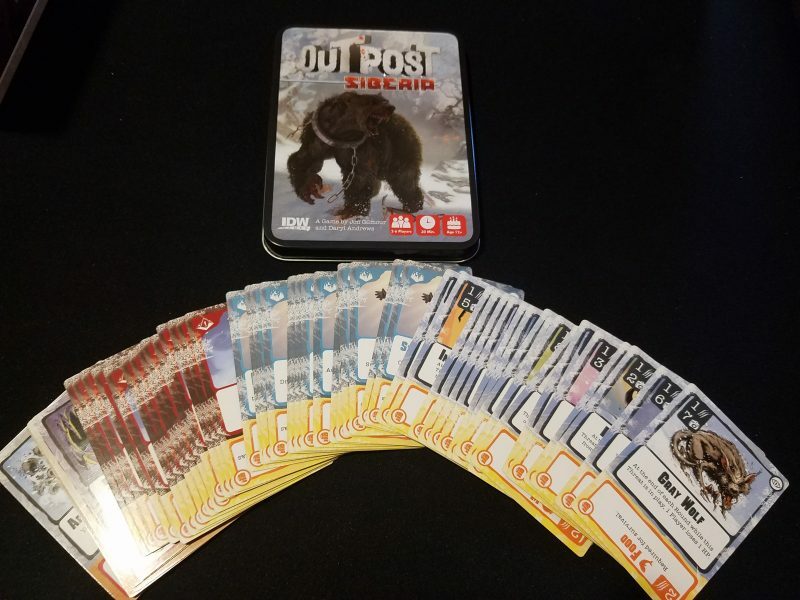 Outpost: Siberia was a GenCon release. Maybe they rushed it out the door to make sure it was available there. I’ve heard that IDW is going to release a full line of co-op survival card games like this. I very much hope the others are better.